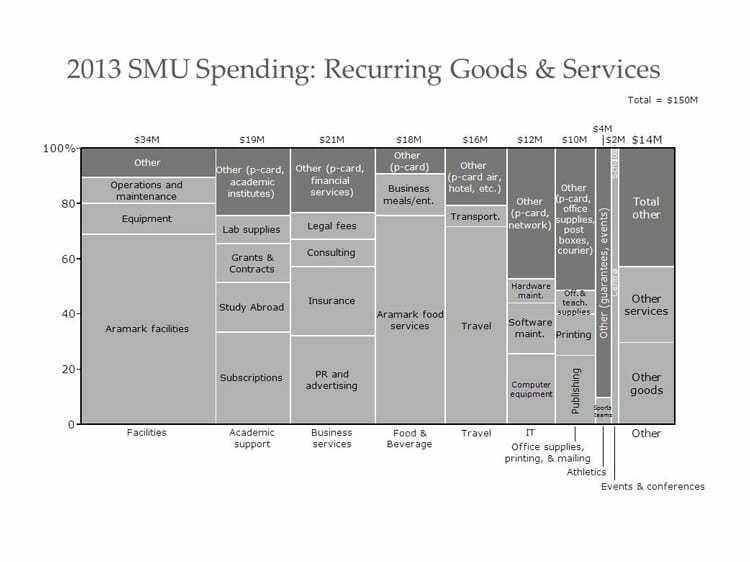 In fiscal year 2013, SMU spent $150 million on recurring goods and services such as business services, food and office supplies. To help the University realize $11 – 15 million in annual savings, the Procurement initiative began its work on November 6, 2014. The Procurement initiative team aims to help the University realize $11-15 million in annual savings by both delivering quick savings in a few specific spending categories and designing a high performing purchasing organization. The Procurement Initiative team is further divided into two sub-teams. The Fast-Track Savings team will identify opportunities for quick savings, create a strategy for achieving savings for each procurement category and implement new strategies throughout the University. The Procurement Organization team will assess SMU’s current purchasing decisions rights, tools and processes, design a best-in-class procurement organization for SMU and evaluate the need for an e-procurement system. How will specialty printer contracts save SMU money? How can we justify the cost of large tents and fireworks as part of the Centennial celebration? How do I print confidential or sensitive documents to a secure printer? How do I order paper for my printer or copier? What is the purpose of the sticker/tag on my printer? My printer is running low on toner and I don’t have access to a network printer yet. Can I purchase another toner cartridge for my printer? Is it true that the number of procurement card holders will be dramatically reduced?